I planned the first week of a theme unit for Kindergarten about space, and in the course of researching the topic, I came across NASA's resources for teachers. If you can, take a few minutes to browse or search through their materials, because they are packed with plans, printable worksheets, illustrations, and ideas. I've read through a few, and they were vastly interesting. Other notable sites include this incredible flash animation of the solar system. It's the only one I've seen where you can center the universe on the Earth and see how the motion of the planet appears to astronomers (something I'd never considered before). Finally, I've put all my space theme unit plans on GoogeDocs here. They're all mishmashed together in the folder, so you'll have some reading to figure out which one goes where (but the names are self-explanatory). References to sources of information are included, but the NASA links are outdated (use the one above instead). P.S. If you're wondering where the image came from, NASA has amazing images in the public domain, all at www.archive.org. Just do a search for NASA, or if you know the name of the image, take a look. 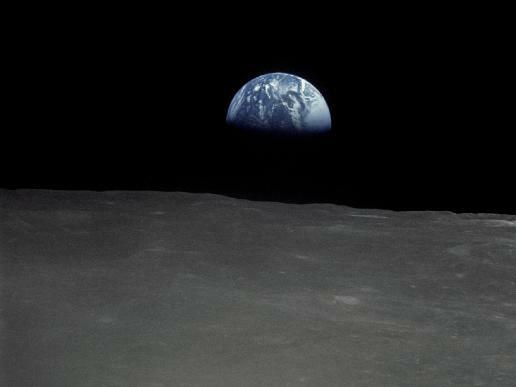 My favourites include EarthRise (above) and the Blue Marble collection of images. Pretty cool stuff.